We will welcome you as guests and accompany as friends! During the Latvian national culture programme “From soup till song” we will spoil you with Latvian traditional food, music and will show you the authentic Latvian national costumes. 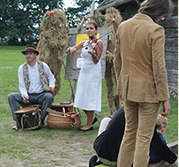 You will have opportunity to see dance performances and to take part in real Latvian dances and games. The most attractive participants will receive gifts – special food recipes to take home. 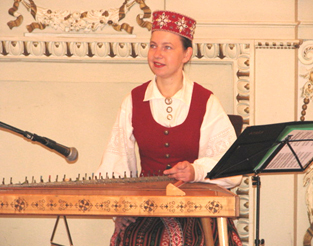 Splendid Latvian national costumes and music instruments – it will look lovely and sincere on your trip memory card. The culture programme takes place in a splendid and historic Riga Latvian Society House “Ligo” Hall in the centre of Riga. The Riga Latvian Society House is the symbol of Latvian national awakening both during the period of foundation of Latvian State and national self-confidence during 19th – 20th centuries, and nowadays. “Ligo” Hall is one of the Riga Latvian Society House celebration halls, because “Ligo” and “Jāņi” are the prominent Latvian national festivity. You are welcome at any time during the year! The event is for groups, announcing itself in advance!